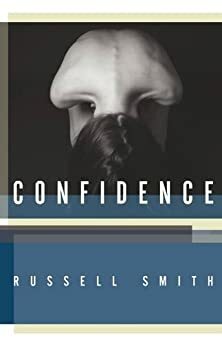 Largehearted Boy: Book Notes - Russell Smith "Confidence"
Book Notes - Russell Smith "Confidence"
Russell Smith's short story collection Confidence is dark, honest, and often funny look at the entitled citizens of Toronto. "We know gentrification, prescription drugs, absorption in handheld screens and the psychic drain of continually comparing ourselves with others, and it does us good to see these phenomena so deftly satirized … but what gives Confidence its emotional power is the isolation of the characters amid all their connectivity. A sad and funny and vivid portrait [of contemporary life] that we hope isn’t as true as we know it is." Confidence is a suite of stories set in a large North American city (it looks like Toronto but it could be a few others too). The people in the stories tend to be educated. They are universally anxious and distracted, and yet also often struck by intimations of poignancy or pangs of yearning. I think their mood is best illustrated by modernist music: sophisticated, witty, but agitated, nervous, with moments of clanging dissonance. If I'm not listening to this while writing, I tend to listen to minimal techno music – quite hard stuff, mostly – because it blocks the noise of coffee-shop or neighbourly stereo without the distraction of singing and words. Its repetitiveness is a kind of silence, as is white noise. Besides, I just love techno and industrial and used to go to dark clubs and do ecstasy; I loved the otherworldliness of the experience, and I still do an all-nighter about once a year. I DJ myself, in my basement, and put my menacing one-hour mixes online for Europeans to listen to. (Canadians do not like it much.) I don't listen to any other kind of popular music. Maurice Ravel, String quartet in F major, 2nd movement ("Assez vif. Très rhythmé. "), 1903. This movement opens with a famous manic, spritely pizzicato tune -- you've probably heard it used in commercials to signify fresh scent or erectile function. It's determinedly chirpy, but the harshly plucked strings seem to betray anger. Then it slows to mysterious sadness. I feel like this on descending into the subway. It sounds like spring and Adderall. Igor Stravinsky, Eight Orchestral Miniatures, 1963. This suite of simple tunes is actually the orchestration of pieces originally written as five-finger piano exercises in 1921 (a piece called "les cinq doigts"). The right hand plays only five notes in each one. I love the piano version – it's lively and melancholy and minimalist all at once – and I enjoy knowing that it has been called, usually disparagingly, Gebrauchsmusik, utility music. I have no problem with utility music. This was composed in an idealistic effort to bring an avant-gardist sensibility to piano exercises for children. It was a heady time. Anyway, I like the later orchestrations of the pieces just as much because there are lots of woodwinds among the 15 players and the resulting texture is unusual. The pace is rapid. Francis Poulenc, Mouvement Perpétuel No. 1, 1918. You know this sweet little one-and-a-half-minute piano piece if you have ever seen Hitchcock's Rope: it's the piece one of the suave murderers keeps attempting to finish playing on the piano in a sprawling Manhattan loft, with a body stuffed into a trunk beneath the hors d'oeuvres. Poulenc is a perfect composer for a film about privileged corruption: he was a fierce urbanite. When he did piano recitals outside Paris, he used to close with an encore piece called "Voyage à Paris", a light song sung by a soprano, that included the line "Ah! La charmante chose, quitter un pays morose, pour Paris! Paris joli!". It was thought he was signaling his joy that his visit to the provinces was over. Poulenc's work is forever verging on being too light, too pretty, but I find that his playfulness is deeply serious. Darius Milhaud, "Le Printemps" for violin and piano, Op. 43, 1951. Milhaud and Poulenc were buddies, part of the clique they called Les Six. This is another perfect miniature – unashamedly pretty, two-and-a-half minutes long, and with no pretence or grandeur. I like a nice restrained artistic ambition. I don't write about genocides – I write miniatures myself. Dmitri Shostakovich, Prelude and fugue #7 in A major, 1952. Well, aside from that it is one of the most beautiful pieces of music ever written... there's not much to say about this. I suppose one could add that is part of a completist project: a series of 24 prelude-fugue pairs for solo piano that includes one piece in each of the major and minor keys of the chromatic scale. It is in its entirety a reference to Johan Sebastian Bach's Well Tempered Clavier and includes specific quotations from that work as well. It brings the fugue – the game of polyphony that is exactly what we play as children when we sing rounds like "Row Row Row Your Boat" – into the steely modern age. It is coldly beautiful, like the singing of the spheres. It is perfection, total artistic perfection, and was written in frigid, oppressed, terrified, destroyed, blackened post-war Leningrad. I cannot think of anything cooler or braver, more soaringly humanist, than the writing of this music at that place and time. I wish that I could see such pure forms in total darkness.